This is a chance for you to pit your company softball team against others in the valley to see who is the mosh ball king. According to Diane Roberts, a board member of the softball association, this year the board voted to give all the profits to the Sam Stringer Memorial Foundation, which gives out scholarships every year for students interested in automotive technology. 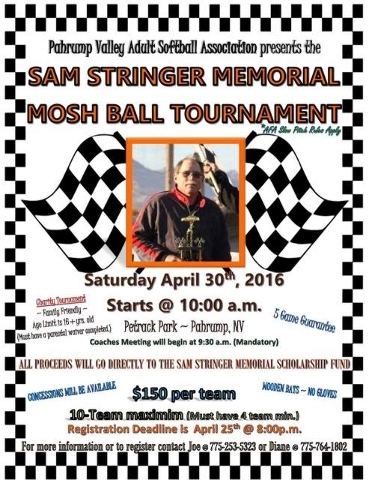 Sam Stringer was a popular race car driver at the Pahrump Valley Speedway who lost his battle with cancer in May of 2012 at the age of 56. That year the first memorial race was held and a scholarship fund was opened in his name. Since then they have had a race in his honor every year in July at the Pahrump Valley Speedway. Roberts said that she has been close to the Stringer family for the past 24 years. “Sheree and I are longtime friends and I knew her husband, Sam,” she said. Roberts defined a mosh ball as being a large 16-inch, soft softball. The tournament will be at 10 a.m. at Petrack Park. Players must be at least 16 years old. “Anyone can enter a team, they do not need to be part of our regular league,” Roberts said. For more information call Diane Roberts (775) 764-1802.